February 19, 1924: “ SANTA FE AND SILVER PICK CLAIMS SOLD AT RANDSBURG—Randsburg Feb. 19, Clark Wortley and associates, have closed the deal for the much sought after Santa Fe property, also taking over the Silver Pick adjoining, making $10,000 as a first payment on a well up in the five figures. Following payments are to be made during the next 12 months. The ground lies north of the California Rand Silver No. 6 shaft and adjoins the Flat Tire, Randsburg Associated, and the Big 4, all under the prospective stage. The Santa Fe consists of two full claims, the Santa Fe and Santa Fe No. 2. The Santa Fe railroad and the county road running through the property and much of Osdick siding camp being built on the Santa Fe property. A well timbered shaft is down 514 feet; surveys of adjoining developments give the encouragement that in an additional depth of 150 feet that they would be in schist. February 29, 1924: “SURVEYS MADE FOR Santa Fe BUILDINGS—Randsburg, Feb. 29. – Surveys for the several foundations, head frame, hoist, compressor and buildings were going Tuesday morning over on the Santa Fe workings. The old hoist and equipment will be started at once, timbering and retimbering, the lower 100 feet of the shaft, now down 514 feet, will be the first work done below. May 9, 1924: “SANTA FE SHAFT ALMOST COMPLETE –Owners Expect Mine to Be on Producing List in Short Time –Randsburg, May 9. – By Saturday it is expected to have the hoist running on the Santa Fe shaft, but owing to the long idle period since the Coyote management ceased operating this prospect, considerable retimbering and relagging in the 514-foot shaft must be completed first. With the knowledge that water has been encountered in the neighboring No. 6 shaft of the California Rand Silver, Inc., the new owners of the Santa Fe group can also prepare for a pumping plant that will handle any kind of a flow. The new owners and operators of the Santa Fe group are eastern capitalists, men that believe that there is a splendid chance to bring in a mine. This belief is so strong that they are expecting their intensive operations to put them on the shipping list long before the next payment on the mine of $30,000 is due. February 10, 1925: “STRIKE PAY ROCK IN SANTA FE SHAFT NEAR RAND NO. 6—Saturday’s day shift on the Santa Fe’s 335 level brought in good-looking rock with ruby silver crystals shot through it: Sunday morning the cross cut 50 feet south of the shaft shows five feet of vein matter with characteristic silver and gold rock as found in the adjoining No. 6 shaft of the California Rand Silver Inc. Samples for assaying will be made immediately after the mucking and clean-up of the lower level. The Santa Fe shaft is owned and operated by Michigan capitalists under the name of the Great Western Mining Company, with no stock on the market. Much delay in the advancement has been caused by the heavy flow of water that has only recently been overcome by three powerful pumps that handle better than 200 gallons a minute. The orders from the principals to J. E. White, superintendent, were to see that the pumps worked satisfactorily before any development or advancement was resumed. This plant is one of the best surface-equipped in the silver zone; at no time have they to shut down for material or supplies. “Go” is and always has been their slogan. February 11, 1925: “SANTA FE STRIKES RICH ORE LEAD – Fifteen Feat in Values Are Shown on 625 –Foot Level With Ruby Stain—­­Showing 15 feet of mineralization in a cross-cut at the 935 foot level the strike on the Santa Fe Claim of the Great Western Mining Company operating north of the famous California Rand Silver Shaft No. 6 near Randsburg, is regarded as one of the most important developments in the district for some time. 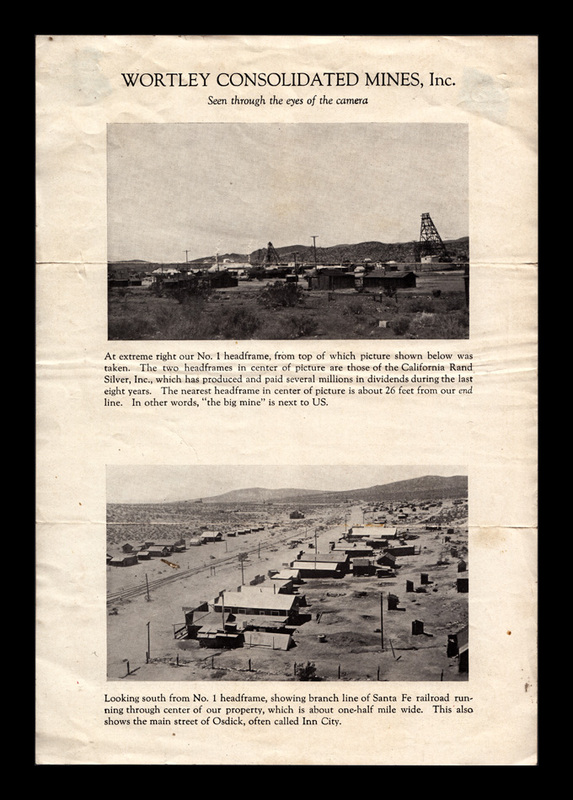 Confirmation of the strike was received yesterday in telegrams from the mining camp. Roy We__ was also in Bakersfield from the mining camp and he reports that the strike encountered on last Saturday is showing up big. Ruby Silver has been encountered and gold values are also found, affording a real excitement for the hardrock miners. STREAKS OF RUBY—Sunday and Monday hundreds of visitors at the mine were fortunate in obtaining fine specimens with streaks of “ruby silver.” Saturday’s day shift on the 935-foot level brought in good looking rock with ruby crystals shot through it. Sunday morning the cross-cut 50 feet south of the shaft shows five feet of vein matter with characteristic silver and gold rock as found in the adjoining No. 6 shaft of the California Rand Silver, Inc. Samples for assaying will be taken, immediately after the mucking and cleanup of the lower level. February 13, 1925: “RICH STRIKE OF EIGHTEEN-FOOT LEDGE RUBY SILVER AND $40 GOLD ORE IN SANTA FE MINE SATURDAY. Saturday last the working crew in the Santa Fe mine at Osdick uncovered a rich ledge of ruby ore carrying some $40.00 in gold on their 935-foot level and since that time the reports are that the ledge is 18 feet wide. This is indeed good news for the Rand Mining District, but new that has been daily for the past several months. This discovery will give to the district another producer that is likely to equal the California Rand Silver in richness. Two or three months ago the ore was just uncovered, but it was accomplished with so much water that the months between the find and the development of it as far as it has gone, had to be spent in finding a way to get rid of the water. A few days ago the new pumps installed in the mine unwatered the shaft and the ledge was uncovered sufficiently to tell the glad news that another mine had been found in the celebrated Rand Mining District. The Santa Fe is owned by the Great Western Mining and Milling Company, with J. R. White as superintendent and manager. The company is not a stock corporation, but just the association of moneyed people, who have had the faith and have from month to month of development work, dug down and put up the development capital. This body of ore is sufficient to make all the members of the company wealthy and will doubtless lead to much building and installation of machinery in the near future. 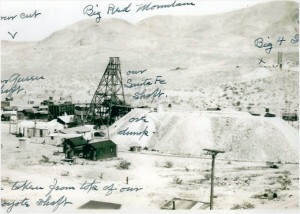 May 15, 1925: “SANTA FE TO GO DEEPER – As the principals of the Great Western Mining and Milling Company have decided to sink and additional 100 fee in their Santa Fe Shaft, the same being now under way, it is as good a piece of news as could break in the silver zone of the Rand Mining district. On their 925 level, where they opened up 18 feet of milling ore they have every indication of developing the same character of high-grade ore that is extracted from the No. 6 shaft of the California Rand Inc., holdings. In all of the many drifts and cross cuts they find ore showing well in ruby. 1929? Wortley Consolidated Mines Company. (Formerly Great Western Mining and Milling Co.) Thiscompany owns or controls several groups of claims in the Randsburg silver belt. The most important are: The California Rand Silver Company’s property (quite recently acquired), the Santa Fe Group and the Silver Glance Group. Below is a description of the Santa Fe only, for other see under the names of the various properties. The Santa Fe Group comprises 15 claims and is in the town of Osdick on the Kramer-Johannesburg branch of the Santa Fe Railroad. It adjoins the California Rand Silver property on the northeast. Owner, Wortley Consolidated Mines Company; C. C. Wortley, president, 502 North Brand boulevard, San Fernando, California; A. W. Ham, secretary, Las Vegas, Nevada. The northeast-southwest and north-south fissures of this district traverse the Rand schist on this property. It is believed by the operators that the Antimony and Williams (?) veins, so extensively worked in the California Rand Silver Mine, have been encountered in their workings. Also a vein which has been called the Schist vein. This latter vein has great width, in places as much as 80 feet. These veins are similar to the veins of the California Rand Silver Mine, in that the schist is mineralized along the two systems of fracturing. Vein filling consists of silicified schist and brecciated schist, recemented with quartz. The mineralization consists of antimonial sulphides of silver, pyrite, chalcopyrite and stibnite. The widths of the veins vary from about 2 feet to 80 feet. The principal development consists of the Santa Fe shaft. This shaft is vertical and is 1200 feet deep. To the 935-foot level it is 1 ½-compartments, below this level it is 2 ½-compartments. The Rand schist was first encountered at a depth of approximately 850 feet. Levels were driven at the 935, 1000, 1100, and 1200-foot horizons. The total underground development at this shaft is 7575 feet. The Antimony vein was first encountered on the 935-foot level about 100 feet northwest of the shaft. It crossed the shaft between the 1000 and 1100 foot levels and has been crosscut on each of the levels. Its width varies from 12 to 30 feet. The Schist vein has been crosscut on the 1000, 1100 and 1200-foot levels; it varies from 12 to 80 feet in width, and according to Mr. C. W. Mitchell, E.M., it averages 19.36 ounces of silver and 0.13 ounces of gold. 935-foot level — Crosscut showed a width of 20 feet. 1000-foot level—200 feet of drifting; average width 15 feet. 1200-foot level—crosscut showed a width of 38 feet. 1000-foot level—150 feet drifting; average width about 20 feet. Raise about 120 feet from 1100-foot to-1200 foot level. Raise about 120 feet from 1000-foot to 1100-foot level. There are several other small veins that have been encountered in crosscuts on the various levels. A drift has been driven some 700 feet southwesterly and an incline raise here put up to hole the bottom of the No. 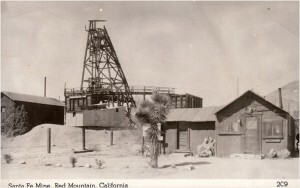 6 shaft of the California Rand Silver Mine. Equipment at the mine consists of 50-h.p. single-drum hoist, motor driven; 12 inch by 10-inch Ingersoll-Rand air compressor, driven by a 60-h.p. motor; 14- inch by 12-inch Chicago pneumatic air compressor, driven by 100-h.p. motor; 3 Byron-Jackson Multiplex pumps, each driven by 30-h.p. motor. The pumps are installed on the 1200, 900 and 600-foot levels; each has a capacity of 200 gallons per minute. There is also a blacksmith shop and assay office. The mine makes 15,000 gallons of water daily. This water has recently been used in the California Rand Silver Company’s mill. August 12, 1930: “RANDSBURG, AUG. 12.—THE “KELLY” MINE is again in the production class, and that the large reduction plant is now running. Frank H. Lamley, a former Randsburg mining and milling man, is in full charge of operations and L. B. Scheu, for many years in charge of the milling will again be in his former position. Walter Smith, lately the Atolia tungsten plant, will be superintendent of the mine. Mr. Smith, is better known in the mining world as “Bull Frog Smith” of Rhyolite and the Bull Frog district. For the time being the mill will run one shift on clearing up ore on-hand. Following up the gold showings made on levels 11 and 12, Number 1 shaft, is the principal intentions of the management. ­­­At the present time, nothing definite could be given out by Mr. Lamley other than the principal work would be done on the Kelly underground workings, of which levels 2 and 4 would be subject to further examination of the gold showings opened in the early operations. The Coyote would in time, as well as the Silver Queen, be exploited, the dewatering of the No. 1 shaft and the Santa Fe, will be determined (later) on. September 24, 1930: “Frank H. Lamley, general manager of Wortley Consolidated Mines Inc. Mrs. Mrs. Lamley and Miss Lamley are visiting at Los Angeles.” Bakersfield Californian. 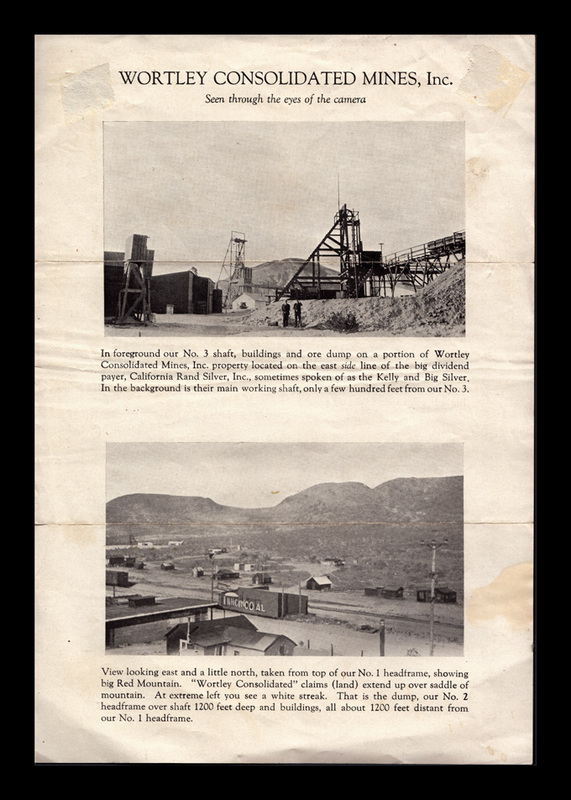 Santa Fe Mine Rosecraft Studios Postcard. Collection of the Rand Desert Museum. July 4, 1931: “START CONSTRUCTION WORK ON FAMED RANDSBURG PROPERTY –Randsburg, July 14.—Sound of activity at the Famous “Kelly” mine, which soon will be placed production again, is bringing comfort to the citizens of this district, who firmly believe that the Rand mines are about to enjoy a revival of the days when silver was king and there was a market for every ounce brought to the market. Preliminary construction work in renovation of the old “Kelly Mine” is under way. Cleaning out of shafts, repairing of the 400-ton flotation mill, cleaning of the dryer for concentrates and a general housekeeping of the entire plant is under way. The Blacksmith shop, changing rooms of miners, shower rooms, assay offices, office buildings and residences are all coming in for their share of the clean-up work. The mine recently was purchased from the Consolidated Metals Corporation by representative mining men of Nevada, California, and Canada in a deal closed at San Francisco. Gordon Cole has charge of the work; shafts No. 2 and No. 6 are being repaired. Working parts will be replaced, shafts will be repaired and other necessary reconstruction work will be affected. Approximately 100 leasers who were given blocks of ground in shafts No. 2 and No. 6 and who turned in their tools with the drop of silver last fall, probably will ask for their old blocks. Ventilation of No. 2 will be one of the most important jobs for the present, and exploration of the shaft’s bottom for gold ore is expected to be one of the first jobs when the work is completed. Frank W. Royer, well-known mining engineer of California, Nevada, and Mexico, made the examination previous to closing the deal. He worked quietly while here. A new 150-tob cyanide process plant will be installed as part of new equipment planned for the mine property. This plant will handle ores, dumps, old stopes and tailings that carry a value which will give the owners a profit over the milling and transportation costs. Sale of the mine is reported to have been a cash proposition. 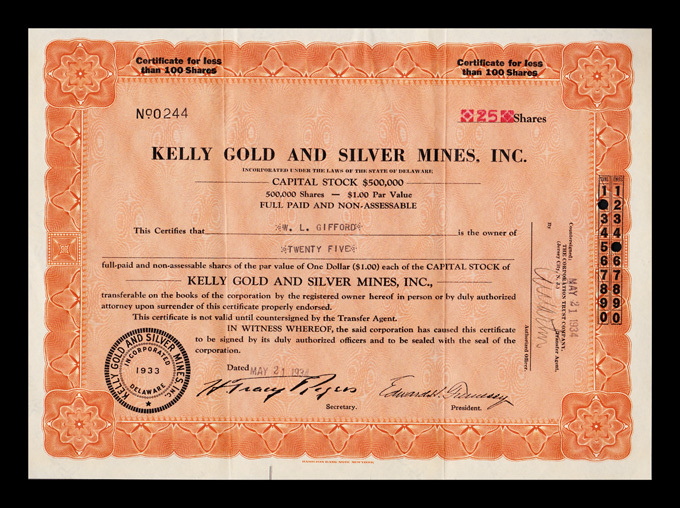 Kelly Gold and Silver Mines, Inc. Stock Certificate. Believed to be a subsidary or Wortley mining.